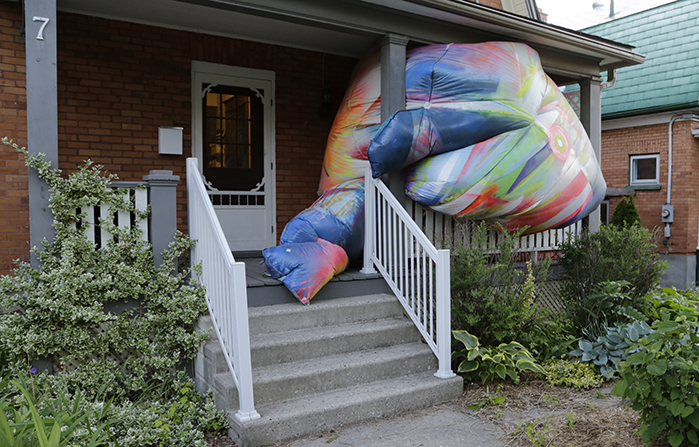 Claire Ashley’s painted inflatable will be installed on a domestic front porch to explore domestic objects of comfort and play, making reference to the people who dwell inside and the thing that makes a house a home. Claire Ashley became interested in inflatables as a parent concerned about the safety of bouncy castles and plastic toys. Her streaks and spatters of Day-Glo spray paint refer to the graffiti that she sees on her commute from Oak Park to School of the Art Institute of Chicago, where she teaches. The surface imperfections such as patches and scrapes that she leaves exposed, make it seem as though her sculptures have been around the block, literally. Lauren Weingberg has written that, "Despite their joyful colors and goofy titles, and the playful connotations of their medium, Ashley’s inflatables have an undertone of menace. Their sagging, bulbous forms recall bodily organs swollen to grotesque sizes." Artist Claire Ashley received her MFA from the School of the Art Institute of Chicago (Chicago, IL), and her BFA from Gray’s School of Art (Aberdeen, Scotland). Originally from Edinburgh, Scotland, Ashley is now Chicago based. Currently, she teaches at the School of the Art Institute of Chicago in the Department of Contemporary Practices, and the Department of Painting and Drawing.